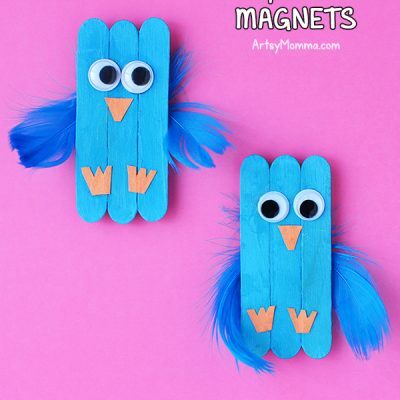 Have you seen all the cool looking water beads activities floating around the web? We finally played with them and they were so much fun! 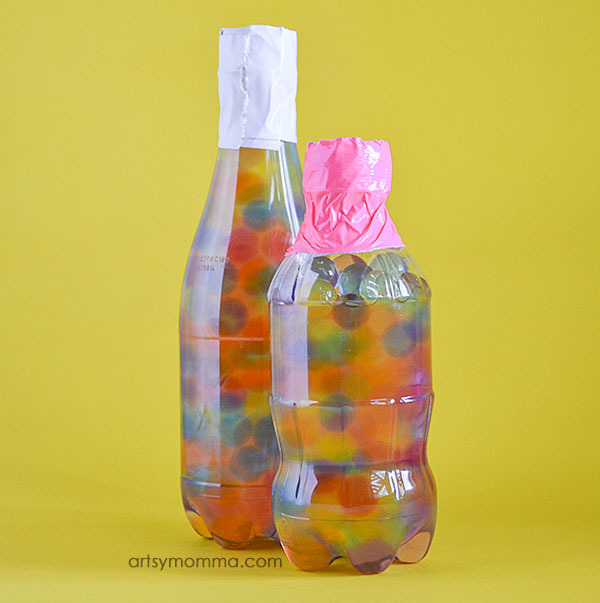 I also made them a water beads sensory bottle toy for added fun. I ordered the colored water beads from Amazon . They aren’t too expensive and provide so much entertainment. 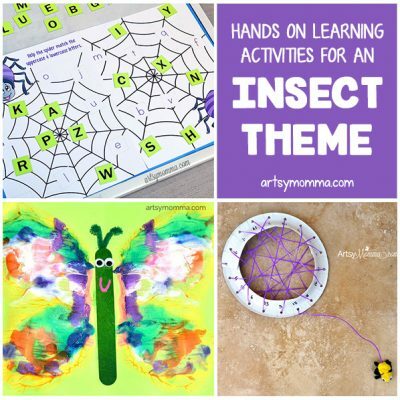 A simple search for water beads on Google or Pinterest will show you lots of different ways to have fun playing with water beads. You might even be able to find these at the dollar store in the candles aisles. Little sister chose which packets to use and put the rest away for another time. She dumped the teeny tiny beads into our water table and I added water. The instructions said it would take four hours. That’s like an eternity in my little ones eyes LOL! They were beyond excited and we’re so intrigued that the water beads kept growing bigger and bigger. It’s neat how much they change in size. 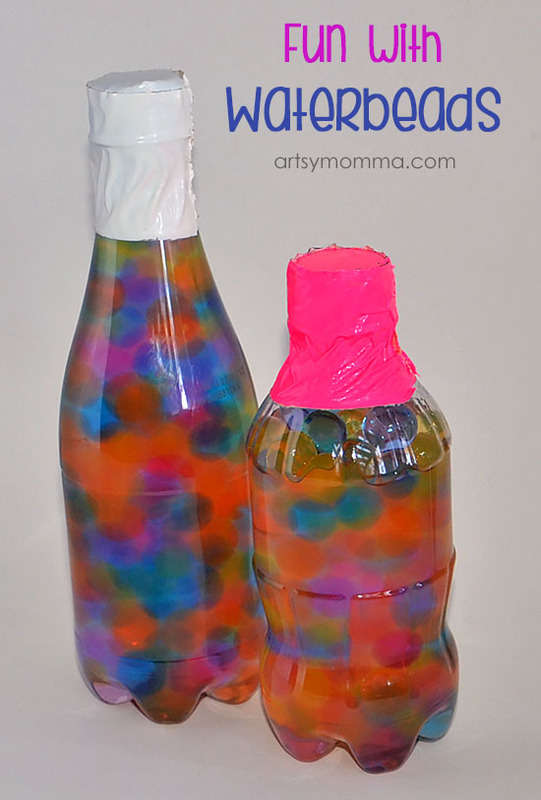 The water beads feel really cool making them a fun sensory activity. The kids loved how the beads felt and were content just using their hands to play with them. They also scooped him with a little measuring cup and watch them fall back down. They also made pretend sprinkles by filling empty sprinkle jars . Little Sister had a blast making pretend food with the water beads (placed them in a bowl and told me that they were things such as ice cream). She also was determined to get all the pink ones out and had fun sorting them. 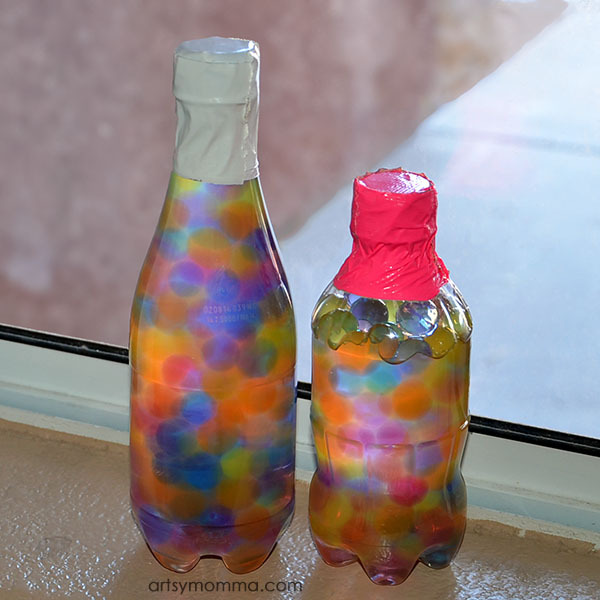 I found two empty, clean bottles and let the kids fill them with the different colored water beads. I asked them not to put in too many and but they insisted that the bottles needed more. 🙂 I filled the bottles with water leaving some room at the top because I knew that they would grow a little bigger still. 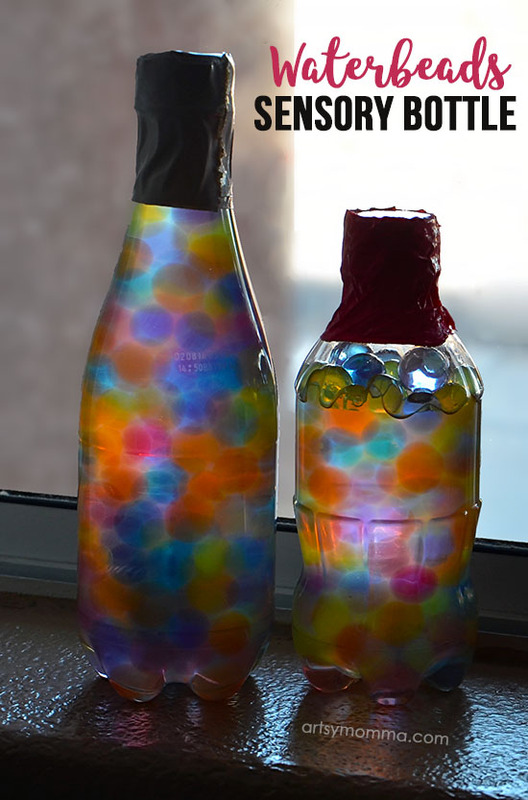 Next time I will try harder to convince them to not put so many water beads in the bottles, allowing the beads to move around inside it more. Since I didn’t want the kids to open the bottle of and possibly make a mess all over the floor, I used duct tape to secure the caps in place. 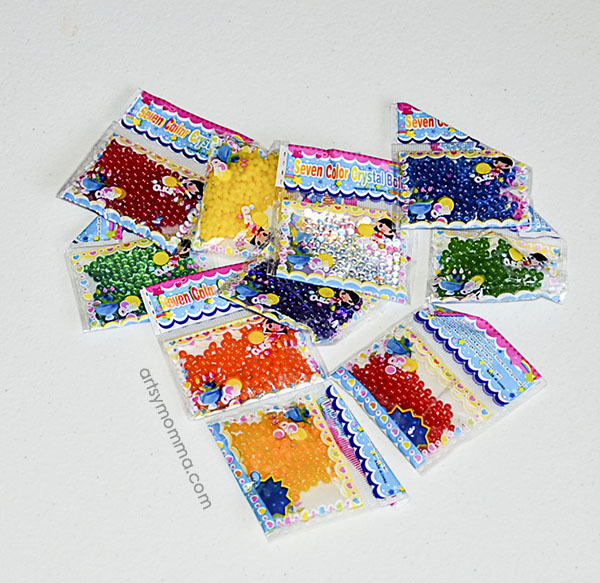 This way I could easily take the tape off and dump the water beads out when we were all done using it this way. I love how colorful the bottles look! The kids held the bottles up to the light and spun them around. They looked so pretty! We also placed the water beads sensory bottle toys in the window sill when not in use – the kids liked seeing them from outside when we would come home from somewhere.